Without spoiling the features which generations of visitors have loved, imaginative schemes have transformed the town centre, old town and Harbour areas. Aptly described as the Garden Coast, explore traditional shop, galleries, studios and boutiques in the Creative Quarter as well as many independent specialist retailers. A Full day by ferry over to France for a taste of the continent and a hop across the border into Belgium visiting the popular resort of Ostend. We head along the edge of the High Weald AONB leading us along the coast to Hastings. 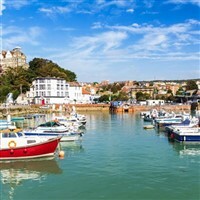 This cosmopolitan town is home to the largest beach-launched fishing fleet in Europe, the remains of the first castle in England to be built by William the Conqueror, and a beautifully preserved Old town. With 550 cosy bedrooms, many with spectacular sea views and private balconies, the hotel is renowned as one of the UK's top entertainment hotels, so guests can relax, dine in style and be magically entertained, all under one roof. There are two restaurants, the Victorian and the Harbour, which serve quality hand-crafted recipes. The Ocean bar hosts the live entertainment programme, music from the resident band and bingo. Guests can also dance the night away at the late night disco. This Folkestone hotel also hosts an extensive Health and Leisure Club, fully equipped with a swimming pool, sauna, solarium and much more.